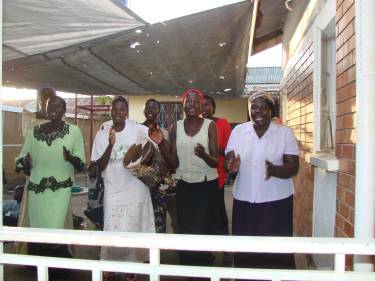 Helping at the Hope Restoration Centre in Lira (UGA03a) are 30 widows and single mothers. They are all victims of the internal conflict with the LRA. 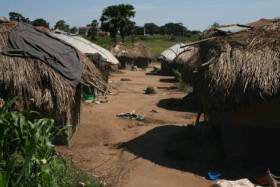 Most are stationed in an Internally Displaced Persons (IDP) camp although some are doing well enough to move into their own rental accommodation, small huts around the location of the IDP. Most are members of the Anglican Church (evangelical) that the children from the Home attend - a few are not Christians. Their ages range from old (60-70) down to around late 30's. These women are desperately poor. They come and help at the home and sometimes even give to the orphans. Their camaraderie and joy is infectious. They don’t have much to do so they come to the home in Lira to help with the children. They all collected a small amount of money together and set up a loan programme. They collected about U/-450,000 ($US265) and started giving loans to each other. Each person devised their own idea for a business and then got a loan from the group. The loans varied from person to person but are between U/-20,000 to U/-100,000. As the loan money comes back they then lend to the next person. These projects range from selling small items, trading food and charcoal, to small restaurants. The widows help each other as they can, but none of them has much. They pray together, share stories and laugh a lot, they meet formally once a week on a Sunday for fellowship. In 2015 two further micro-loan sub-groups centred around a local Lira church (Kirombe Pentecostal Church) were commenced as part of this partnership. Kirombe Pentecostal Church has a strong focus on caring for the surrounding community. Anna has identified two leaders from this local church who have received training and support to lead each of the newly established groups. One group has 14 people, the other one 8. These new groups run on exactly the same processes as the existing loan programme and use the same loan books. They are assisting local women, widows and single parents to support their families by establishing and growing their small businesses. In the late 1990's and into early 2000 the Lord's Resistance Army (LRA) rebels came to the villages in the North of Uganda capturing hundreds of young people and children and killing their parents because they were too old to convert into rebels, sometimes in front of the children. Many people who weren't killed had their homes and farms destroyed by these rebels and had to flee their villages. A lot of these people are still living in IDP camps as they have nowhere to go. Bright Hope World first heard about some of these atrocities in 2005 from Anna Ocen, who was working in another partnership being developed. At that stage we gave some funds to get 28 children out of the IDP camp and into better accommodation and in 2006 we commenced regular funding of the Hope Restoration Centre (UGA03a). During a visit by the BHW Field Director to the Hope Restoration Centre in July 2008 the plight of these widows was brought to his attention and their desire to set-up a loan programme. Following a further visit in September 2009, by which time the widows had their loan programme up and running, it was decided to assist these ladies take their income earning to the next level. The 52 widows and single mothers who will be helped by the ability to access larger loans. This will also then have a flow-on effect to their families and the children they help look after. These women have had such a hard life and have experienced horrific trauma and violence. It is so encouraging to see them taking some initiative and finding a way to not only help themselves but also help others. There is huge potential here for a relatively small amount to significantly improve the lives of these ladies. Anna Ocen is the key person for us in this partnership. Anna is married to Simon and they have a small family of their own and a few others they care for and have brought into their family. 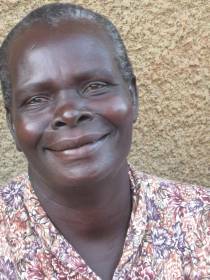 They live in Mbale but Anna travels to Lira once or twice month to visit the ladies there. She is an accountant so is able to provide good reports. The opportunity here is to set up a loan fund to help these women establish themselves financially. Justina is 70 years old and quite frail. Her husband died of asthma in 2008 at 90 years of age. She had two children and her daughter was killed in the war. Her son is a drunkard and is no help. 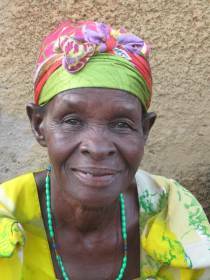 She has been left with nine grandchildren to care for. She has no land for a garden and usually only has one meal a day. She has an old bed and mattress, all that is left after the relatives of her husband took all her possessions when he died, this included a bicycle and some cattle. It was after her husband died that she became a believer in Jesus. She now goes to the All Nations Pentecostal church. Her Christian friends have become her family and she gets a lot of help and encouragement from them. She doesn’t have a Bible. She has many needs and asks everyone to pray for her. She has arthritis and ulcers on her legs. She has started a little business buying and selling charcoal, soap and small items of food. Florence has been a widow since 1988, her husband died of liver cancer. She is 50 years old and had seven children, two of them have died. She is trying to care for her five grandchildren whose parents have died, they range between 14 and 4. They are very poor and usually only have one meal per day; sometimes all they have is a cup of tea for a meal. Her church helps a little but not much. She became a believer in 1987. Her faith is the most important thing in her life, without that she would have lost hope and committed suicide. Florence has bad knees and struggles to do some chores. She makes mats and has a small garden. She has started a small business as a produce seller. From time to time she goes to a village and buys vegetables and brings them back into the city on a truck to sell. Semmy is just 27 years old. She has five children ranging in age from 11 down to a one year old. 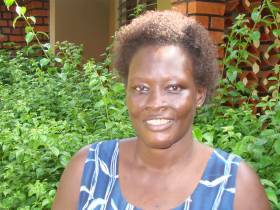 Semmy is a widow, her husband was killed a year ago while she was pregnant with their fifth child. He was a seller of skins and hides and he fell off a truck in 2008 while on the way to Kampala. On the death of her husband she had to leave her husband’s village and leave everything behind. Her husband’s death made her very angry and bitter but she has come to a place of forgiving the people who caused her husband’s death. Her mother sometimes helps her but she is a poor woman too and a widow. Her friends also help her and she buys and sells produce. She has no garden and even though she makes a little money she has very little left after paying rent for her house. Her house rental is around UGS15,000 ($US8-9) per month and her income is around UGS20,000 ($US11). She is part of the widows programme and wants to increase her ability to make more money. Her eldest child is now in Primary 5 at school and the costs for sending her children to school is only going to rise in the future. Pascolina is 60 years old. 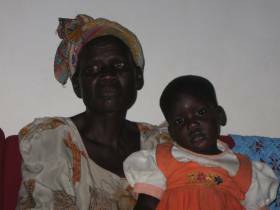 Her husband was killed by the rebels in 2003 and she has been trying to support her family alone since then. She has five children and the fourth child is disabled and needs a lot of care. She seemed okay when she was born but did not develop normally. She does everything for the girl who is a very quiet person, she is able to walk but has limited mental capacity. In 2001 her daughter was raped and for a long time she wished her daughter would die and then she would die too. She has been a believer since 1985 but her husband was not. Before she became a Christian she would have fits but since that time she has not, God helps her every day and comforts her. She has a small business selling food. Some days she can make 6,000 Uganda shillings but other days not much. She usually has to lock her daughter in the house to go out and sell. Before her husband was killed they had land and cattle but the raiders took it all. She could grow produce if she had land again. When she was chased from her home she managed to get somewhere to live that is rent free. Moses is her youngest son and is 15 years old. It appears he will have to finish school at the end of 2009 as she has no job and no money. 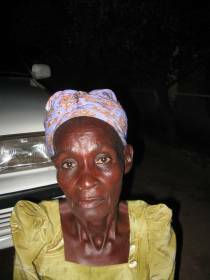 Florence is 59 years old and had 11 children, four of them were killed in the war. Her husband was a soldier and he was killed in the internal conflicts with rebels in 1986. At the moment there are five adults and two grandchildren living in her house. The mother of the grandchildren is dead and now Florence is a mother all over again. Before her husband was killed they lived in a village and they were farmers, they grew maize, beans and millet and had cattle. But that was all stolen by the rebels. They now live in a cousin’s house and she has a small business selling vegetables and millet porridge to her neighbours if it’s not raining. When it rains they don’t buy. She can make about 4,000 ($US2) UGS per day and about 7,000 ($US3) if it’s not raining. She eats once a day and tries to feed the children two meals per day. She has a small garden. 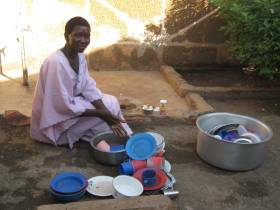 With help, she would like to buy material and make and sell table cloths. It would be useful to have budget training to help with managing the house. In 1984 she became a believer but not her husband, she was very bitter after her husband died and again later when she found herself in a refugee camp, but she says she now has peace.